Ideal for a development kit, proof-of-concept box, or OEM application, Micro/sys enclosures meet the needs of embedded system integrators. Whether in a laboratory, NEMA enclosure, rackmount system or benchtop controller, Micro/sys provides a variety of enclosures with maximum adaptability. All enclosures have mounting holes for PC/104, 5”x 5”, EPIC and/or EBX-sized computer boards, and can hold up to 3 stacked PC/104 modules. To maximize options and make field service or maintenance easier, the enclosures are designed with multiple cable and connector cut-outs and terminal block/accessory mounting holes. Micro/sys enclosures range from a 19” rackmount frame that is 3U high to a small unit that houses microcontrollers or a single PC/104 board. There are LCD Flat Panel Enclosures in 6.4”, 10.4” and 17” sizes for systems that require the embedded computer box to be separate from the display. These flat panel enclosures are louvered for air flow and heat dissipation. When a box solution is needed, there are two Embedded Computer Enclosure versions, one with terminal blocks mounting externally, and one with a 6.4” LCD Flat Panel Display. There is a Subfloor available for applications requiring open frame mounting. 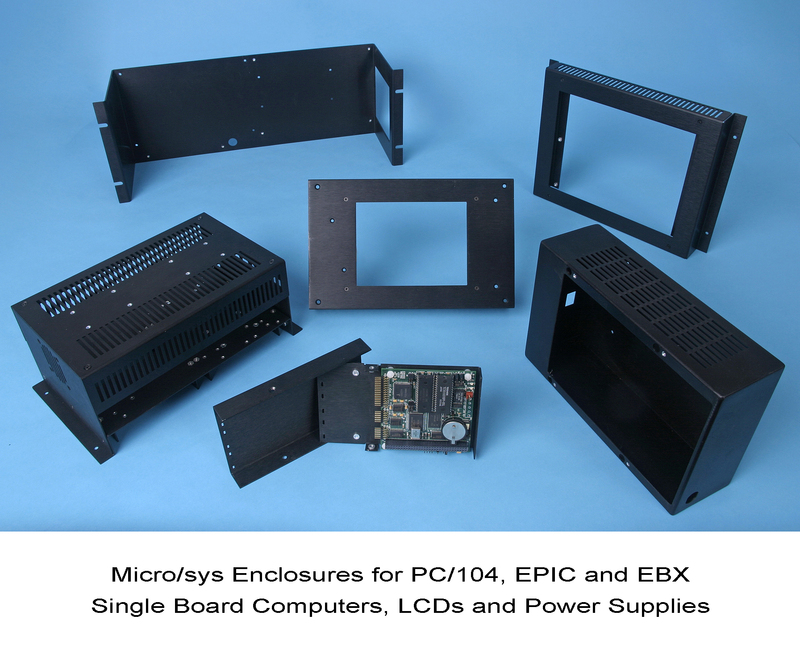 In addition to this broad line of off-the-shelf enclosure solutions, Micro/sys offers custom-built designs for embedded applications with unique needs. The Micro/sys enclosures start at $75 in single quantities while significant OEM discounts are available. Contact Technical Sales Dept., Micro/sys, Inc., 3730 Park Place, Montrose, CA 91020, phone (818) 244-4246, URL: http://www.embeddedsys.com.